For the millions of Americans combining the spiritual and the decorative in their homes—from dramatic crosses in a modern log cabin to handcrafted Native American spirit masks in a sprawling Southwestern ranch—this beautifully rendered book of interior design depicts how the serene touch of religious design elements can be effortlessly incorporated with a modern sensibility. Whether as a reflection of fervent belief, a secular nod to nostalgia, or a purely aesthetic choice, devotional objects such as religious idols, crosses, and Buddha statues have a profound visual power. 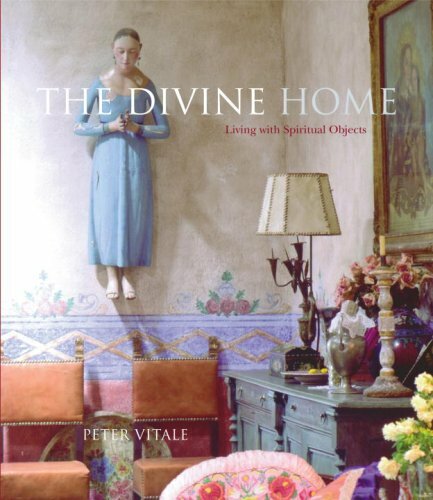 Within these pages are thirty homes in which works inspired by religious traditions form a vital and varied part of the sumptuous and serene design of these spaces. Some of the people featured in this dramatic book collect with a geographic interest, some define their collections stylistically, and still others choose a historical framework. Yet all of the residences share a distinctly personal touch. Personality, in fact, runs rampant through these interiors that tell stories about the owners, the objects, and the houses themselves, such as CeCe Cord’s sunny Texas residence, John Saladino’s calm California villa, Kelly Klein’s soaring Manhattan loft, and Adrienne Vittadini’s richly textured Florida home. While some of the residents have personal spiritual connections with their pieces—like a Santa Fe psychoanalyst and his varied collections of Outsider art, African works, and Judaica—others merely find in the antiquities a sense of beauty and comfort. An interior designer who updated a rustic Colorado cabin is drawn to decorating with crosses for their geometric appeal as opposed to their religious connotations. In New York and Los Angeles, two different homeowners escape their busy lives in peaceful, calming environments created with Asian art. While the religious or spiritual elements are quite pronounced, they blend seamlessly into fascinating, eye-catching hybridized environments—from French Provençal to Spanish Colonial to light, airy patrician. Each residence—captured by one of the most sought-after interior photographers—will enchant you with its beauty and originality and perhaps inspire you to begin a spiritual collection of your own. A collection, as these homeowners explain, starts with one artwork, but it is one piece that can lead to a magnificent obsession.